Happy Saints: 20% off ‘Let’s Pray With St. Thérèse’ eJournal! 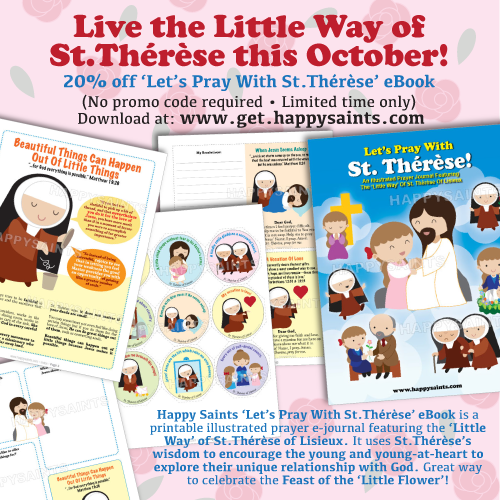 As we celebrate St. Thérèse of Lisieux’s feast day on October 1st, let’s live her ‘Little Way’ with the ‘Let’s Pray With St. Thérèse’ eBook! The Happy Saints ‘Let’s Pray With St. Thérèse’ eBook is a printable illustrated prayer e-journal featuring the ‘Little Way’ of St. Thérèse of Lisieux. It uses St. Thérèse’s wisdom to encourage the young and young-at-heart to explore their unique relationship with God. Great way to celebrate the Feast of the ‘Little Flower’! Get it now at 20% discount for a limited time only! No promo code required!